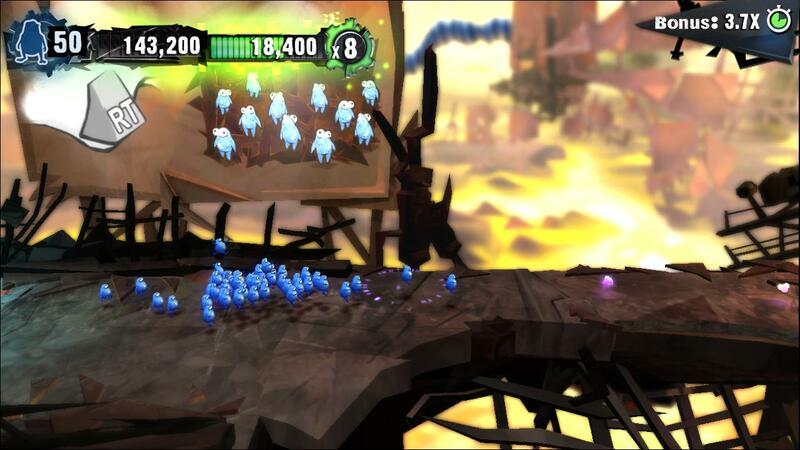 The Swarmites have landed, bringing lots of death, destruction and a frantic dash to keep your points multiplier high. 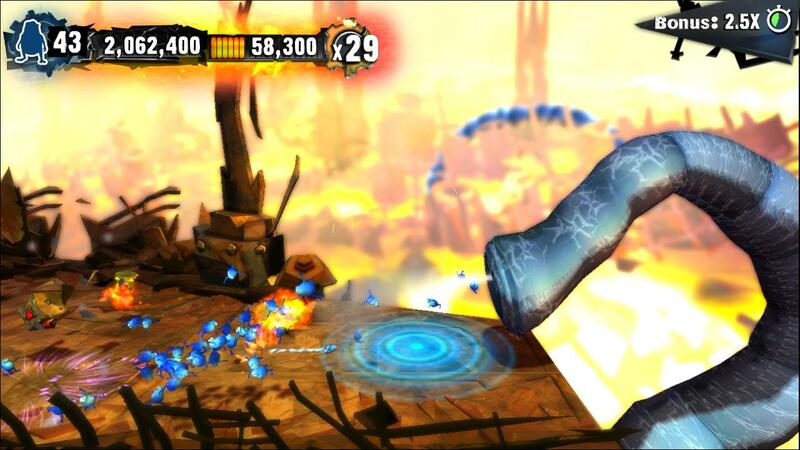 That's a basic description of the latest XBLA title from Hothead Games, Swarm. The story is very basic, it's more about the gameplay. 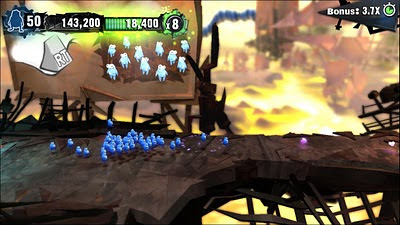 The Swarmites (up to 50 at any one time) have to traverse one of the most dangerous planets in gaming history, trying to collect DNA orbs in order to save their race, whilst keeping the Swarmites alive. The twist is that killing your Swarmites also counts towards the multiplier. So you basically have to sacrifice some for the greater good, as you can only progress to the next level by beating a target score. For the first few levels, this is no problem, and it's easy to see your score sail past a million. Soon enough, the game gets hard, and the fun factor is reduced dramatically. It's a shame, as the game's first few levels are really fun and definitely charming. It gets to the point, where there is nothing new to be introduced, far too soon, and the fun often turns into frustration. Never a good thing. The main gameplay mechanics are huddle, spread, stack, boost and jump. Each level utilises each of these a variety of times, and whilst figuring out which to use in each situation does need a bit of thought, it doesn't require much, and the lack of new mechanics really doesn't help the game. One of the main selling points of the game is the variety deaths the game has to offer. There's vaporising, burning, being impaled, decapitated, gassed and blown up, and there are more. Considering they are tiny blue guys with no human traits, the deaths are quite gruesome and fun to watch, and the older age rating does seem justified. Gaining medals for the deaths does add some replay value, but that's only if you can find the motivation to play at all. The game isn't terrible. It is obviously well developed and the graphics are nice enough. It just simply doesn't have enough to be a top seller. The levels become too similar and you use all of the available mechanics far too early in the game, so it's hard to recommend Swarm. Try out the trial as it might be for you, but it's hard to see Swarm selling incredibly well.